Definitions of shock and resuscitation endpoints traditionally focus on blood pressures and cardiac output. This carries a high risk of overemphasizing systemic hemodynamics at the cost of tissue perfusion. In line with novel shock definitions and evidence of the lack of a correlation between macro- and microcirculation in shock, we recommend that macrocirculatory resuscitation endpoints, particularly arterial and central venous pressure as well as cardiac output, be reconsidered. In this viewpoint article, we propose a three-step approach of resuscitation endpoints in shock of all origins. This approach targets only a minimum individual and context-sensitive mean arterial blood pressure (for example, 45 to 50 mm Hg) to preserve heart and brain perfusion. Further resuscitation is exclusively guided by endpoints of tissue perfusion irrespectively of the presence of arterial hypotension ('permissive hypotension'). Finally, optimization of individual tissue (for example, renal) perfusion is targeted. Prospective clinical studies are necessary to confirm the postulated benefits of targeting these resuscitation endpoints. It was fatal for the development of our understanding of circulation that blood flow is relatively diffcult while blood pressure so easy to measure: This is the reason why the sphygmomanometer has gained such a fascinating influence, although most organs do not need blood pressure but flow. Restoration of tissue perfusion is the ultimate goal of resuscitation. 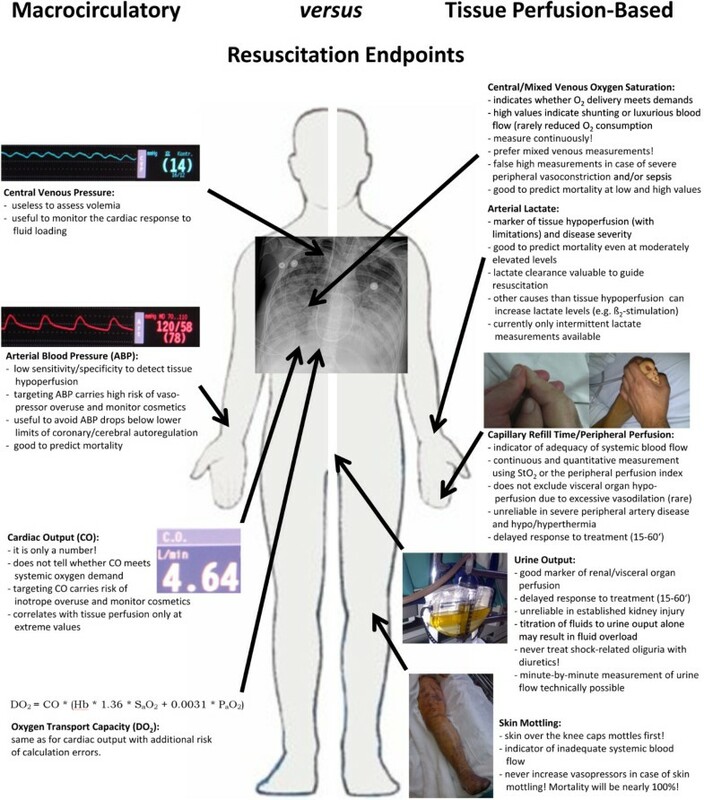 Endpoints should indicate shock reversal and, thus, when to stop or continue resuscitation. Targeting inadequate endpoints implies the risk of over- or under-resuscitation, both of which worsen outcome [1, 2]. Current recommendations suggest targeting a mean arterial blood pressure of at least 65 mm Hg , central venous pressure of 8 to 12 mm Hg, central venous oxygen saturation of at least 70%, and urine output of at least 0.5 mL/kg per hour as resuscitation endpoints in severe sepsis and septic shock . However, from our point of view and clinical experience, this approach (which focuses primarily on macrocirculatory parameters) carries serious pitfalls, the most important of which is overemphasis of blood pressures instead of flow. This implies a high risk of overusing vasoconstrictor drugs and aggravating tissue hypoperfusion. The aims of this viewpoint article are to critically evaluate limitations of current resuscitation endpoints and alternatively propose a three-step approach based on markers of tissue perfusion as resuscitation endpoints in shock of all origins. From a physiologic perspective, the influence of vascular tone and arterial blood pressure on microcirculatory perfusion is in contradiction to the interpretation by many physicians. While arterial hypotension due to arteriolar dilation is commonly assumed to result in decreased microcirculatory flow, physiologic experiments implied that vasodilation-induced arterial hypotension improves microcirculatory blood flow (Figure 1) . Hydrostatic pressures in circulation. Microcirculation pressure is indicated by shaded area. Values shown to the left and right indicate arterial and venous portions of circulation, respectively. Unlabeled solid curve in both frames represents a normal pressure profile. Left panel: curve A represents maximal arteriolar constriction, and curve B represents arteriolar dilation. Right panel: curves A and B represent decreasing arterial and increasing venous pressures, respectively. Reprinted with permission from the American Physiological Society . Although critical arterial blood pressure levels have been proposed for diverse shock populations [6, 7], the inter-individual variation of the correlation between arterial pressure and systemic blood flow is substantial (Figure 2) . Several studies revealed that, within auto-regulatory limits of the heart and brain, arterial blood pressure correlates only poorly with microcirculatory flow in critical illness [9–11]. Accordingly, elevating blood pressure with norepinephrine resulted in unpredictable effects on capillary perfusion and organ function in sepsis [12–14]. Normalization of blood pressure with the use of a vasoconstrictor, such as phenylephrine, without concomitant increases in blood flow during cardiopulmonary bypass deteriorated microcirculatory perfusion . 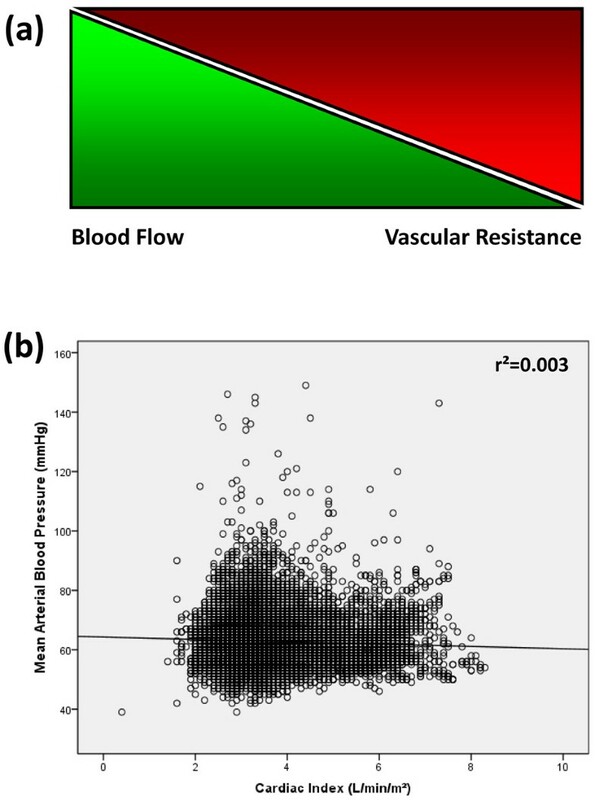 In patients with impaired heart function, any vasopressor-mediated increase in vascular resistance augments left ventricular afterload and may reduce cardiac output , rendering any increase in blood pressure of little or no benefit for global tissue perfusion. Physiologic components of arterial blood pressure (a) and correlation between mean arterial blood pressure and cardiac index (b) in 39 patients with sepsis. The number of pulmonary artery catheter measurements was 15,836. Tissue hypoperfusion in shock may further be aggravated by vasopressors used to achieve a specific arterial blood pressure - progressive hypoperfusion may even be (mis)interpreted as irreversible shock. When high vasopressor doses are deemed necessary, mortality is excessively high and continued treatment has been considered futile . Accordingly, mortality was 100% in septic shock patients who received norepinephrine of more than 0.5 μg/kg per minute despite signs of peripheral hypoperfusion . Similarly, vasodilatory shock patients who exhibited ischemic skin lesions and received vasopressin to achieve a mean arterial blood pressure of at least 60 mm Hg had an extremely high mortality . Despite its common use to guide volume resuscitation and the Surviving Sepsis Campaign recommendation to administer fluids to increase central venous pressure to 8 to 12 mm Hg , there is no evidence supporting the role of central venous pressure as an endpoint for fluid therapy [20, 21]. In contrast, culminating evidence indicates that central venous pressure is not correlated with volemia but influenced by various factors such as right ventricular function, intrathoracic pressure, and venous compliance . By recruiting unstressed volume and inducing venoconstriction, vasopressors can increase central venous pressure, thus disguising hypovolemia . When compared with an echocardiography-based fluid resuscitation protocol, use of a central venous pressure of 8 to 12 mm Hg as a guide to fluid loading resulted in over-resuscitation in a substantial number of patients with sepsis . In support of a poor correlation between macrocirculatory endpoints and tissue perfusion in shock, the majority of critically ill patients with sepsis continued to exhibit signs of tissue hypoperfusion despite reaching macrocirculatory endpoints (for example, mean arterial blood pressure of at least 65 mm Hg and central venous pressure of at least 8 mm Hg). Further resuscitation efforts improved venous oxygen saturation and lactate levels but did not affect arterial blood pressure [25, 26]. Despite striking data on the lack of a relationship between macrocriculatory variables and tissue perfusion in shock, the majority of recommendations and physicians still focus on these variables as resuscitation endpoints for the care of patients in shock. In a European survey, the hemodynamic variables most commonly claimed to guide septic shock resuscitation were mean arterial blood pressure (87% of intensivists), central venous oxygen saturation (65%), central venous pressure (59%), systolic arterial blood pressure (48%), mixed venous oxygen saturation (42%), and cardiac index (42%) . In contrast to common beliefs, tissue and microcirculatory perfusion is physiologically regulated by changes in blood flow and not arterial blood pressure. Under physiological and most pathophysiological conditions, regulation of blood flow occurs autonomously in the tissues and is driven by metabolic demand . Vasoactive end products (for example, adenosine, potassium, and protons) and other vasoregulatory mediators (for example, nitric oxide and adrenomedullin) released into the capillary bed and a reduced post-capillary partial oxygen tension result in arteriolar dilatation through direct and indirect mechanisms (venular-arteriolar feedback) . Further mechanisms of regional blood flow regulation may include endothelial shear stress  and the release of vasoactive substances by red blood cells . Thus, some tissues (for example, the musculature) can amplify their blood supply by a factor of up to 100 . Only when systemic blood flow can no longer increase to compensate for peripheral vasodilation and arterial blood pressure starts to decrease does sympathetic control override tissue-driven blood flow regulation . Reduced stimulation of arterial baroreceptors activates the sympathetic system and results in peripheral vasoconstriction in an attempt to preserve heart and brain perfusion, even if this goes along with global tissue hypoperfusion as observed in shock (centralization). To avoid blood pressure cosmetics and vasopressor overuse in shock, resuscitation endpoints need to be reconsidered. 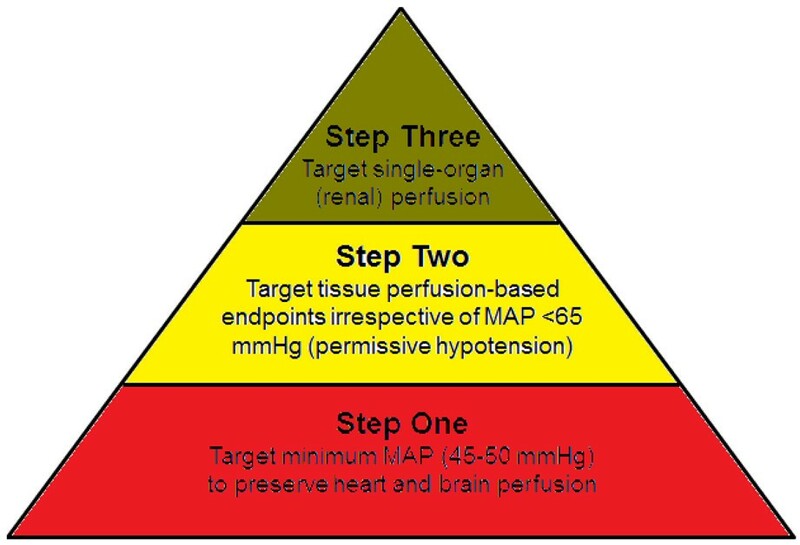 The authors propose a three-step approach of resuscitation endpoints which is based on growing evidence and physiological considerations (Figure 3). Hierarchy of resuscitation endpoints. MAP, mean arterial blood pressure. In line with physiological principles, maintenance of heart and brain perfusion represents the primary resuscitation goal. Although arterial blood pressure does not accurately predict global tissue perfusion, it correlates well with coronary and cerebral blood flow [32, 33]. In contrast to current recommendations [3, 4], our clinical experience suggests that lower mean arterial blood pressures (for example, 45 to 50 mm Hg) are mostly suffcient to adequately perfuse the heart and brain in acute situations. These observations are in accordance with physiological experiments suggesting a lower threshold of coronary and cerebral autoregulation of 45 to 50 mm Hg mean arterial blood pressure [32, 33]. However, individual constellations must be respected. For example, patients with critical aortic valve stenosis, subtotal carotic stenosis, significant left main stem stenosis, or severe right ventricular failure (or a combination of these) typically need higher mean arterial blood pressures to ensure heart or brain perfusion or both. Even higher arterial blood pressures may be required in patients with primary neurologic pathologies (for example, traumatic brain injury or vasospasm in subarachnoid hemorrhage). In most patients, cardiovascular failure is not severe enough to reach critical arterial hypotension to acutely endanger heart and brain perfusion. If coronary or cerebral perfusion is endangered, vasoconstrictors need to be administered acutely, even though they may induce global tissue hypoperfusion. Yet clinicians must be aware that such an emergency treatment simply avoids cardiovascular collapse but does not restore (and potentially even worsens) global tissue perfusion. The assumption that a mean arterial blood pressure of at least 65 mm Hg is generally required to preserve heart and brain perfusion may lead to significant overuse of vasoconstrictors and unnecessary induction of tissue hypoperfusion . If heart and brain perfusion is maintained or has emergently been restored, the main endpoint of resuscitation is restoration of global tissue perfusion. Thus, resuscitation endpoints targeted during this phase must reflect adequacy of global tissue perfusion. Despite numerous attempts to identify an accurate endpoint of microcirculatory perfusion , none has so far proven to be implementable at the bedside. Until reliable markers have been identified, the authors suggest applying the following pragmatic indirect/downstream markers of tissue perfusion as resuscitation endpoints: arterial lactate, peripheral perfusion, urine output, or venous oxygen saturation (or a combination of these). Accepting that all of these targets carry limitations and further parameters [36–39] may be useful and even become the future tissue perfusion-based endpoints of choice, we suggest using a combination of the above-mentioned parameters as tissue perfusion-based resuscitation endpoints in shock of all origins (Table 1 and Figure 4). In the authors' experience, the absence of two or more of these signs reflects global tissue hypoperfusion and should be considered a reason to initiate/continue resuscitation. We advise measuring all variables (for example, central/mixed venous oxygen saturation, peripheral perfusion index, and tissue oxygen saturation) at regular intervals or, whenever possible, continuously. Fluids, red blood cells, inotropes, vasodilator. Vasopressors only to ensure minimum mean arterial blood pressure for coronary and cerebral perfusion! aDepending on the phase of resuscitation (15 minutes during the early, unstable phase; 60 minutes during the subsequent, more stable phase). Presence of two or more abnormal categories (arterial lactate, venous oxygen saturation, arterial lactate, and urine output) indicates shock. Shock reversal can be assumed if one or no category reveals abnormalities. Bedside considerations of macrocirculatory versus tissue perfusion-based resuscitation endpoints. Hb, hemoglobin; PaO2, arterial partial pressure of oxygen; SaO2, arterial oxygen saturation; StO2, tissue (muscle) oxygen saturation. In patients in whom vital organ and global tissue perfusion is improving or has been restored, macrohemodynamic variables such as arterial blood pressure and cardiac output appear to be of minor importance. For example, in a critically ill patient who passes suffcient amounts of urine, who has good peripheral perfusion, whose lactate levels are normal or adequately decreasing, and who exhibits a central/mixed venous oxygen saturation of at least 60%/70%, even very low arterial blood pressures (for example, mean of 45 to50 mm Hg) can be accepted as long as no signs of cerebral or coronary hypoperfusion arise. In view of the currently recommended arterial blood pressure target of 65 mm Hg, this concept may also be referred to as permissive hypotension. Physicians should specifically adopt this concept when caring for patients in severe shock on high vasopressor support. Reducing vasopressor doses, increasing systemic blood flow by fluid and inotrope therapy while accepting mean arterial blood pressures just above the lower cerebral/coronary autoregulation limit (for example, 45 to 50 mm Hg) is often the only way to reverse advanced shock, restore tissue perfusion, and facilitate survival. Only if global tissue perfusion is restored should optimization of single-organ perfusion be considered. This, however, needs to be critically weighed against the potential risks of intensifying catecholamine therapy [40, 41]. Particularly in patients with severe shock, restoration of global tissue perfusion may require intense fluid and catecholamine therapy and thus may not allow focusing on tertiary resuscitation endpoints. Given that of all internal organs the kidneys have the poorest capability to adjust to reductions in blood flow , optimizing single-organ perfusion is, in most patients, equivalent to optimizing renal perfusion. Providing that systemic blood flow has been optimized based on indicators of global tissue perfusion, renal perfusion can typically be optimized by changes in vascular tone and re-distribution of systemic blood flow. In these situations, increasing norepinephrine doses may augment kidney perfusion and urine output in patients with adequate global perfusion [14, 43, 44]. In view of the poor correlation of arterial blood pressure and renal perfusion, studies have proposed various arterial blood pressure targets to optimize renal per fusion. Sonographic determination of the renal resistive index may help to optimally adjust vascular tone to improve kidney perfusion . During attempts to optimize single-organ/renal perfusion, maintenance of tissue perfusion-based endpoints needs to be guaranteed and the risk/benefit ratio of further increases of vasopressor doses must be critically weighed. Definitions of shock and resuscitation endpoints traditionally focus on blood pressures and cardiac output. This carries a high risk of overemphasizing systemic hemodynamics at the cost of tissue perfusion. In line with novel shock definitions and evolving evidence of the lack of a correlation between macro- and microcirculation in shock, we strongly recommend that macrocirculatory resuscitation endpoints, particularly arterial and central venous blood pressure as well as cardiac output, be reconsidered. In this viewpoint article, we proposed a three-step approach of resuscitation end-points in shock of all origins. This approach targets only a minimum individual and context-sensitive mean arterial blood pressure (for example, 45 to 50 mm Hg) to preserve heart and brain perfusion. Further resuscitation is exclusively guided by endpoints of tissue perfusion irrespectively of the presence of arterial hypotension ('permissive hypotension'). Finally, optimization of individual tissue (for example, renal) perfusion is targeted. Prospective clinical studies are necessary to confirm the postulated benefits of targeting these resuscitation endpoints. MWD and AB drafted the manuscript and revised it for important intellectual content. JT and JB revised the manuscript for important intellectual content. All authors read and approved the final manuscript.